Local fisherman Pete Dupuy and his Ventura Fish Company work to bring you this high-quality fresh seafood despite efforts by West-coast fishery managers to restrict your access to this resource. The Ventura Fish Company is family-owned and operated. Pete Dupuy, and his longline fishing vessel Ventura II, as well as all U.S. commercial fishermen, operate under a complex web of strict state, federal, and international regulations designed to insure that the harvest of fish are sustainably done, overfishing is eliminated, and the incidental capture or mortality of unmarketable fish, sea birds, sea turtles, and marine mammals is within acceptable limits. To ensure that these standards are met, federal fishery observers accompany 100% of all the Ventura II’s fishing trips. Of the nine U.S. regional fishery management councils, the Pacific Fishery Management Council is the only one that authorizes a longline fishery, and then prohibits longline fishing within its jurisdiction. Many think this illogical situation exists to reserve access to prized billfish, tunas and other gamefish for the sport fishing sector. Consequently, despite that Pete Dupuy’s 9-year catch record with the Ventura II is a model of sustainability, and meets all state, federal, and international commercial fishing standards, The Ventura II is forced to travel hundreds of miles offshore in order to provide you, as well as other local seafood consumers, with the high-quality, fresh swordfish, tunas, mahi-mahi, opah, wahoo, and shark you deserve and are entitled to enjoy. The Pacific Fishery Management Council has failed to do its self-stated job of ensuring that fishery management plan goals provide a long-term, stable supply of high-quality, locally caught fish to the public, minimize economic waste, adverse impacts on fishing communities, and provide viable and diverse commercial fishing opportunities. 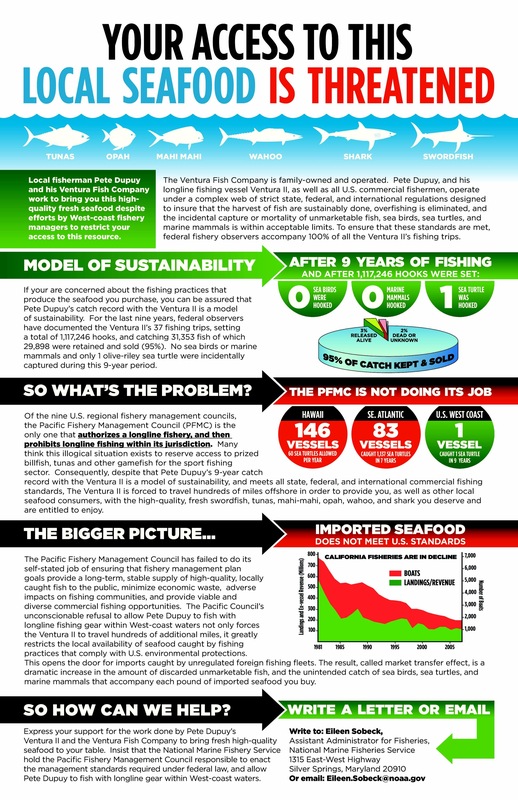 The Pacific Council’s unconscionable refusal to allow Pete Dupuy to fish with longline fishing gear within West-coast waters not only forces the Ventura II to travel hundreds of additional miles, it greatly restricts the local availability of seafood caught by fishing practices that comply with U.S. environmental protections. This opens the door for imports caught by unregulated foreign fishing fleets. The result, called market transfer effect, is a dramatic increase in the amount of discarded unmarketable fish, and the unintended catch of sea birds, sea turtles, and marine mammals that accompany each pound of imported seafood you buy. Express your support for the work done by Pete Dupuy’s Ventura II and the Ventura Fish Company to bring fresh high-quality seafood to your table. Insist that the National Marine Fishery Service hold the Pacific Fishery Management Council responsible to enact the management standards required under federal law, and allow Pete Dupuy to fish with longline gear within West-coast waters.